When I first started gardening, I knew I would probably be spending a lot of time weeding. What I didn’t realize is just how devastating insects can be! Growing cabbages and broccoli has proven nearly impossible. Squash beetles tore through my plants one summer; hookworms got the tomatoes the next. Everyone has these “war stories”. Yet most of us know that excessive use of pesticides is harmful to the micro-ecosystem of our garden. In addition, pesticide use usually exacerbates the problem as pest insects can usually reproduce more quickly than beneficial insects and so their population rebounds faster than the “benes” can keep up. Surely there is a better way to bring in the good bugs and deter the bad ones. The first group of beneficial insects are the pollinators. Bees, which include over 4,000 species such as honeybees, bumblebees, carpenter, sweat, leafcutter, and mason orchard bees, pollinate one-sixth of the world’s flowering plants (including over 400 agriculture plants). One-third of everything we eat depends upon honeybee pollination, including plants such as alfalfa (a major livestock fodder), soya beans, clover, and coffee (yes, some of us are desperately dependent upon bees). Poor pollination can lead to problems such as fewer seeds for saving, misshapen and/or stunted fruit, and lower yields. 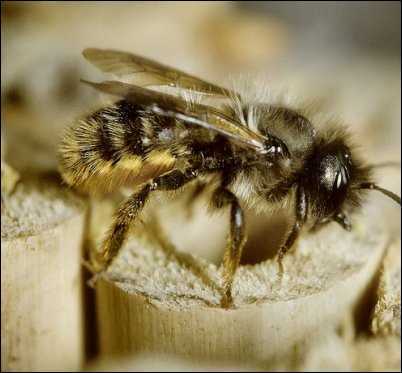 Yet bee populations are dwindling everywhere as they face problems with varroa mites, loss of wild bee habitat, widespread use of pesticides, colony collapse disorder, and the spread of aggressive African bees. While not as prolific and efficient in pollinating as bees, butterflies, and moths are still very useful in the garden. However, like the bees, butterflies are facing pressure from pesticides and habitat-loss. The annual value of all pollinators (exclusive of managed honeybees) to U.S. agriculture is estimated between $4.1 and $6.7 billion. Other pollinators include certain types of flies, beetles, ants, and bats. In order to attract pollinators, consider four things: plant selection, limiting pesticides, providing shelter, and creating habitats for nesting. First, plan for long, continuous blooms; try to provide food sources for the insects from the first little violets of spring to the late fall burst of goldenrod. Both bees and butterflies prefer native plants; are attracted to large blocks of one color; like to forage in sunny, open areas; and are drawn to blues, purples, and yellows (with butterflies also liking reds and oranges). Bees prefer flat or shallow blossoms that allow for easier landing (e.g. zinnias, Queen Anne’s lace, daisies). Consider herbs such as lavender, basil, borage, thyme, and hyssop; as well as groundcovers like clover and creeping mint. Bees also frequent fruit trees and nut trees such as apples, cherries, and almonds. While bees certainly visit vegetable plants, especially zucchinis and pumpkins, you can increase your yields by interspersing flowers and herbs in the garden and letting some of the plants bolt. It’s a bit harder to select plants for butterflies because you need to research which butterflies are in your area and which plants they prefer for food and which ones they need for hosts. While many butterflies will feed on the nectar of various plants, most will only lay their eggs on certain “host plants” because those plants are the only food that their larvae will eat. Most of us are familiar with the monarch and its host plant, milkweed. 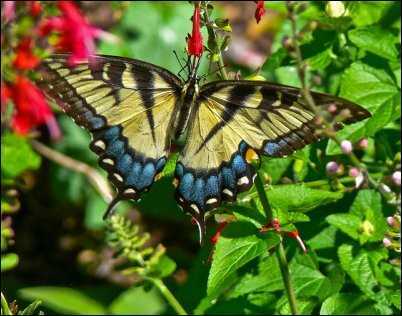 Another example is the Tiger swallowtail, which lays her eggs on plants such as apple, cherry, and plum trees and tulip trees. Some host plants for the American Painted Lady are thistle, garden balsam, and hollyhock. Butterflies also benefit from additional food sources such as melon rinds and overripe fruit left out for them. Finally, consider placing a shallow watering area for the insects, perhaps a shallow dish or a flat stone in a bird bath that would be just below the water level (this is known as a puddling tray). Maintaining healthy numbers of bees and butterflies is just one reason to avoid or reduce the use of pesticides and insecticides in your garden. Many believe that pesticide use is at the root of colony collapse disorder (when there are suddenly very few adults in a bee colony). If pesticides must be used, try to avoid dusts and try to avoid spraying plants that are in bloom. Risk can also be lessened by applying pesticides in the late evening, at night, or in the early morning when fewer insects are foraging. Try to avoid highly toxic pesticides such as Scout and Sevin and select ones of lower toxicity such as Bt and Dipel. You can also attract bees, butterflies, and moths by providing shelter. Obviously, beekeepers maintain hives but it also easy to provide homes for other types of bees, such as the orchard mason bee. This bee is a native, solitary bee that is non-aggressive yet is an efficient pollinator (it does not, however, produce honey). It usually lives in hollow stems, holes in trees, or within woodpecker drillings and lays about 5-10 eggs in “tubes”. A nesting box can be easily built out of untreated lumber with holes of 5/16”diameters that are about 4-8 inches deep. Similarly, shelter can be provided for pollinators like the paper wasp by placing a birdhouse, without its bottom, in the garden (this might also encourage them to stop building nests in your light fixtures). Another lovely addition to the garden might be a butterfly house-it looks similar to a birdhouse but has narrow slits that only butterflies or moths can fly into, though some argue that these are more often used by spiders and wasps. 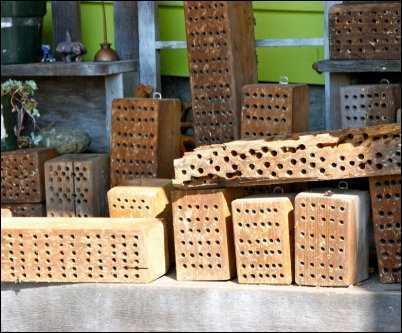 Finally, bees and butterflies need places for nesting and overwintering in order to thrive in your garden. Suburban living and HOA regulations have destroyed many habitats. In addition to planting host plants and providing bee and butterfly houses, consider leaving some dry reeds, a small brush pile, an old log, or a stump in place for nesting and overwintering. Next up are the “guardians” of your garden: these insects eat those nasty pests before the pests eat your veggies! Like the bees and butterflies, these insects will benefit from having a ready food source, a low level of pesticide use, shelter, and habitat for nesting and overwintering. It is also helpful to know exactly which plants attract them and which pests they devour. Ladybugs (aka lady beetles): The ladybug is familiar to all but you may not recognize the larvae, which look like tiny crocodiles and are dark with flecks of red or yellow. The orange eggs are usually placed near aphid colonies and the larvae can consume several dozen aphids, caterpillars, mites, and mealybugs in one day; some even eat powdery mildew. Use early blooming flowers to attract ladybugs and allow some aphids to exist so that the larvae will have a food source. 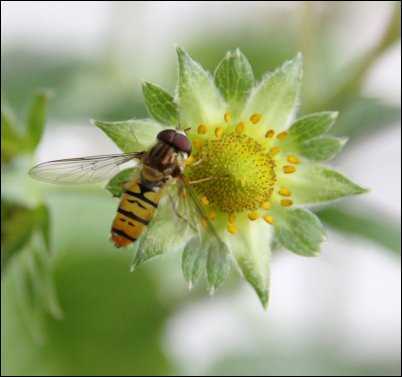 Hoverflies (aka syrphid flies): These flies look like yellow jackets but are harmless; they can be distinguished in that they only have two wings and large compound eyes. The larvae are small, tapered maggots. 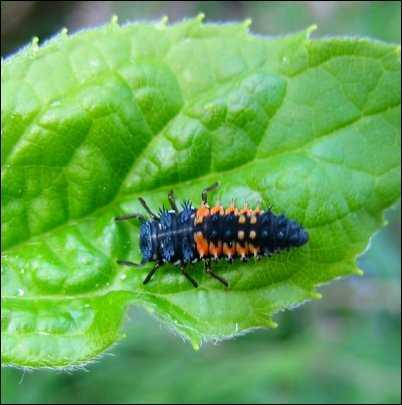 The larvae eat aphids, small caterpillars (including caterpillar worms), thrips, scale, and mites. The adults forage for nectar (and help pollination) and prefer annuals such as bachelor buttons and sweet alyssum as well as buckwheat and herbs, especially catnip, oregano, and chives. 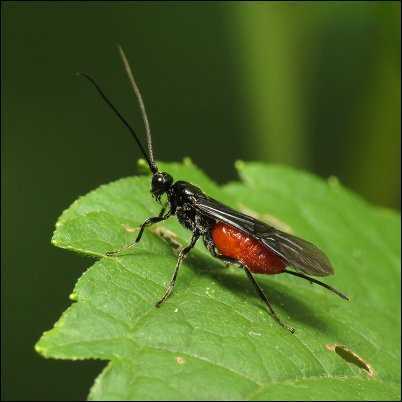 Braconid wasp: The 2,000 species of this wasp are non-stinging and are about ½ an inch long, with narrow abdomens and long antennae; they are mostly black with some yellow-orange. The adult lays eggs inside an insect host and the larvae then feed on the prey when they hatch. The larvae prey upon caterpillars (including caterpillar worms and tomato hornworms), aphids, flies, beetle larvae, and leaf miners. The adults seek the nectar of cluster flowers such as yarrow, fennel, dill, and carrot. The species Aphidium colemani is often used to keep pests under control in greenhouses. Lacewings (aka aphid lions): Lacewings are brown or green, are about one inch long, and have finely veined transparent wings; they are most active in the evening. They also lay eggs near aphid colonies – each egg is suspended from a “stalk”. The larvae will eat aphids, cabbage worms, and white flies. 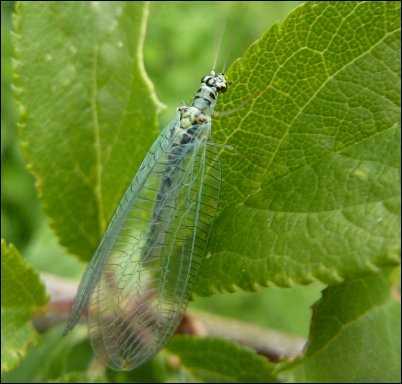 In order to attract more lacewings, remove row covers in the evening when they are more likely to be foraging and spray a solution of one tablespoon of sugar and one cup of water onto aphid colonies. The species Chrysoperla rufilabris is often available for purchase and release. Ground beetles: The ground beetles comprise a large group of over 2,500 species that usually have long, dark shiny hard-shells that are black or brown. They usually live in the soil beneath mulches and plants, near compost piles, or in tunnels. They are voracious eaters that hunt along the ground for pests such as cabbage worms, Colorado potato beetles, corn earworms, asparagus beetles, cutworms, and slugs. They are very sensitive to pesticides; Bt may be the only pesticide they can tolerate. The key to keeping ground beetles around is to maintain a habitat with plenty of perennials, mulch, and stones or boards that don’t need to be moved. Ground beetles are particularly attracted to clover, amaranth, and low growing herbs like thyme and oregano. Beetles can be collected from rotting logs and released into the garden—know that they are more active at night. Praying mantis: The mantis is the only insect fast enough to catch flies and mosquitoes and one of the few insect predators that feed at night. They will devour aphids, leafhoppers, caterpillars, grasshoppers, and crickets as well. The mantis lays a tan or cream ribbed cocoon that contains about 200 eggs on fences, branches, or crotches of trees or bushes. Egg cases are most often found while pruning and can be safely moved; the nymphs will survive. However, the cases should be attached to a branch at least a couple of feet high—if placed on the ground, the nymphs will be eaten by ants. Also keep in mind that just one application of pesticide can wipe out a garden’s entire population of mantises. 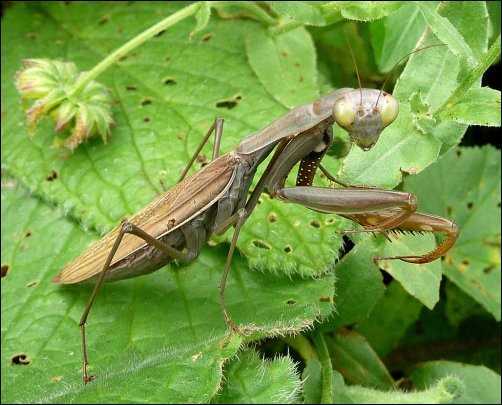 Praying mantis prefer tall grasses, shrubbery, and plants in the rose and raspberry families. Other creatures that help to reduce pest populations are toads, frogs, snakes, and bats. Toads and frogs can be attracted to your garden by providing moist, shady places under loose rocks, shrubs, and boards, or even using a “toad home”: a clay pot (it stays cool in the summer) with an entryway cut or chipped from the rim and placed upside down. Toads and frogs are particularly effective at catching slugs and snails. Likewise, snakes will reduce a slug or snail problem as well as keeping small mammals out of the garden (of course, they also eat toads and frogs!). Black snakes and king snakes can even help to reduce copperhead numbers. Contrary to popular belief, bats don’t often carry rabies (there have been less than 10 cases of human rabies infection from bats in the last 50 years) and they don’t get caught in your hair. However, bats will eat up to 1,000 insects in an hour (a nursing mom might catch up to 4,500), including cutworms, mosquitoes, June beetles, stink bugs, and leafhoppers. In tropical climes, they help to pollinate bananas, cashews, figs, and mangoes. In order to attract bats, consider adding a bat house. It should receive seven hours of direct sun, should be at least ten feet above the ground, within 1,500 feet of a water source and within 10-30 yards of the tree line. Put up the home by late winter so the bats can find it by springtime. Bats will also appreciate night-blooming plants such as moonflower, evening primrose, and nicotiana, as these will attract nocturnal insects. Initially, playing “zookeeper” in the garden is a significant investment in time and money. However, once you attack significant numbers of pollinators and guardians to your land, you can reap the benefits of healthier plants and higher yields… and then you’ll just have to contend with the weeds.